Quick update & preface: No show this week. Too much happening with the 144k Campaign & the – Piercing The Veil – Through the Global Leyline Tachyon Chamber Project. But I’ll be back next week, with a VERY special guest. For now … make sure you read this BREAKTHROUGH article that’s being communicated to our galactic family. It was AWESOME therapy for one lady who proof-read it … so it may well have the same affect on you. Unlike my previous articles, this one will be short … partly because of the urgent need for the Resistance, all other off-world groups & ET souls incarnated here for the first time … to receive this intel that is proving hard for them to truly ‘absorb’ … process … & thus understand at the real-world practical level … about the real reasons why surface Lightworkers attack each other. Henceforth in this article … I’ll be speaking to all off-world groups, not only the Resistance Movement. Reason #1: Most of us are just a few lifetimes away from going dark. As an off-worlder … you’ll know that the Archons, were once Angels. You know that interaction with things like the Primary Anomaly … being trapped in linear time (without getting out soon enough) … endless wounding down to soul level … along with the compounding perversion of consciousness … easily overcomes a great being of Light if they are not retrieved out of such a realm soon enough. This article will allow you to finally truly understand this. Or as we on the surface put it … To really ‘get it’. Because how can any Lightworker attack another, when working and fighting side-by-side? So what I need to do is explain to you … as an off-worlder … the technical mechanisms of how insanity works. I will not only explain why Lightworkers attack each other in the context of fighting side-by-side against tyranny … but I will also explain why all positive groups such as the Freemasons … Templars … Christians … and all the orders we all know about that started off on the positive path from their pre-ancient mystery school roots … turned into mechanisms of tyranny. Let’s begin … with me introducing you to the average surface Lightworker….taking a deeper look beyond the public facade of ‘love & light’ … best intentions … and smiles. Now imagine this chart above, as only one layer (of what’s inside a Lightworker), representing only one negative period or event … in only one lifetime. Then imagine having quite literally 5-12 layers of these per lifetime. Then multiply all these layers by the thousands of life-times Lightworkers that have been stuck on the surface since Atlantis, have lived. Because the majority of Lightworkers have been here since Atlantis, so we’re talking 11,000 to 25,000 years worth of lifetimes. That’s a lot of lifetimes! How Darkness uses this to cause attacks. So think of each one of those words listed in the chart, as a gap, or conduit … darkness ‘accesses us’ at levels well beneath the threshold of our conscious awareness. you don’t know what it feels like to be taken over or impacted like a grenade, by the energetic charge of anger, rage, pain, etc … and then having that amplified by the internal negative entities coming through that same gap/conduit. you don’t know what it’s like to have your consciousness level knocked down to the ground, thus no hope of recognizing “sent” thoughts, or “sent” emotions straight from darkness. you’ll never know … until you’ve experienced it yourself, to the degree & quantity that we have … on a daily basis … for the past 11 to 25 thousand years. You CAN’T understand it … until you experience it HERE … and for that long. Lets get specific, with a fairly typical example. … and it compounds (in terms of negative charge) again. Now you’ve got yourself a FIGHT. Mind you … they were having to focus & concentrate on the work at hand and on working with each other … all the while darkness has all the time in the world to orchestrate this very deliberately (because they’re outside of linear time) and strike from below the consciousness level & psychic visual awareness of the two Lightworkers trying to concentrate on lightwork. So try working as a Lightworker for 11 to 25,000+ years under this kind of typical condition. When dealing with the issue of Lightworkers ‘attacking’ each other, you’re not really dealing with Lightworkers or ‘poor character’ … you’re dealing with darkness itself. Lightworkers attacking each other is nothing more than a RESULT. … you’re dealing with phenomena that doesn’t – and can’t – make any sense … ever. And any psychiatrists or evolved enough spiritualists will tell you … you can’t reason with CRAZY. Now you know what sort of a fight you have on your hands. Now you know what sort of fight WE have on our hands. For you … after a day of hard work fighting darkness, you get to retire to a 5 star resort & sleeping quarters on board some ship. We get to go to our bedroom that we have to work hard just to pay the rent for, and have darkness as our constant companion. We have the charming honor of fighting (oops, sorry … ‘working’) all over again on the non-physical planes during our sleep state. We have to wait & save up for technologies only a fraction as good as what you have access to. Try living under such conditions for 11,000 to 25,000 years … and we’ll see how easy it is for you to keep calm next time darkness jabs real hard on an unresolved wounding through what another Lightworker says or does, below the level of their conscious awareness. The accurate physical analogy of all this is … if darkness manipulated me through my conduits to hold a red hot piece of iron to your skin … would you keep calm & refrain from taking a punch at me? That’s what happens to our emotional bodies, when darkness works through one Lightworker for the deliberate purpose of attacking another, to break up the network & camaraderie. Passing the critical mass of ‘Internal Conduits’, that causes once great beings of Light to go dark … or be greatly puppeteered by darkness. Remember … this is the same thing that caused once great Archangels … to go completely dark. These were GREAT Beings of Light! Greater than what we or you are – as far as I’m concerned … and they deserve true & special honor (for what they once were)! The simple message under this sub-headline is … the more layers of conduits (see the above chart) you sustain … the more your inner light gets covered over or overwhelmed by the darkness within your energy system, and thus … you start to channel more darkness, and less light … beneath the level of your conscious awareness. And we’ve ALL been there … and guilty of it to varying degrees, depending on how many layers of conduits we have … how long we’ve been stuck on this planet for … and of course, how successful we’ve been in the internal clearing & healing work. Approximately 90% to 98% of surface Lightworkers are either rendered harmless (from darkness’s perspective) … or forced to devote all their time & energy to self-healing … with about 2% active & functional enough to have any impact. This is why ET souls started incarnating here after WWII en masse, because the vast majority of Lightworkers who’ve been here since Atlantis (this still makes up the majority of surface Lightworkers) … were & are … largely taken out. 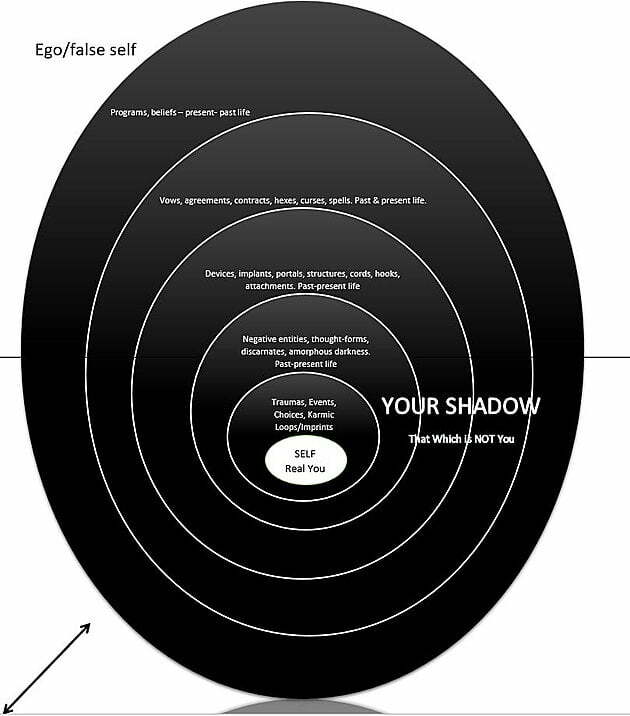 Below is another visual demonstration that helps explain what precipitates Lightworkers attacking each other. I’m using such visuals because verbal communications have such severe limitations when one tries to express oneself to another person … let alone to an off-worlder. Cut down genetically … blind & battered. The true state of surface Lightworkers. The result of being trapped here & fighting (oops, sorry … transmuting) darkness in all its forms & expressions since Atlantis … WITHOUT A BREAK. Good luck with 3D functionality! And I haven’t even started on all the external interference! I’ll just say, all the affects you’ve read so far resulting from the internal state of each Lightworker … DOUBLE it … and you have the external (the Veil, Archon Grid, etc) affect too. Enough said … (as the saying goes)! So I’ll just finish with this. I really hope you’re better able to understand now, why Lightworkers “attack each other”, without having experienced what it’s actually like to be here for yourselves. We’re so relieved you’re here. We promise … our functionality & full potential impact on planetary liberation efforts WILL RISE, through projects like the 144,000 Activation Campaign! Spot on fellow warrior. Very well said. I truly needed that. Have you ever considered publishing an e-book or guest authoring on other sites? I have a blog based upon on the same information you discuss and would love to have you share some stories/information. I know my viewers would enjoy your work. If you’re even remotely interested, feel free to shoot me an e-mail. EXCELLENT ARTICLE!! let’s all work together forget the EGO and manipulation. We are warriors of light an United We Stand! Let’s not give away our power to separation. That’s what they want. Really well put and I fully agree with this summary. One picture speaks a thousand words, this is exactly how it feels. you tell the real truth for once yay! make this article a sticky!